The Bureau of Land Management’s Upper Snake Field Office in Idaho contributed the following article to show some of the successful sagebrush country conservation practices they are implementing. BLM staff identified an area in southeast Idaho as having potential fire risk. They established fuel breaks, which is a gap in vegetation or other combustible material, which act as barriers to slow or stop the progress of a fire. The following is a success story on how a network of fuel breaks prevented a fire from growing much larger than it did. Driven by strong winds, the Wildhorse Fire rapidly spread across the rangeland. 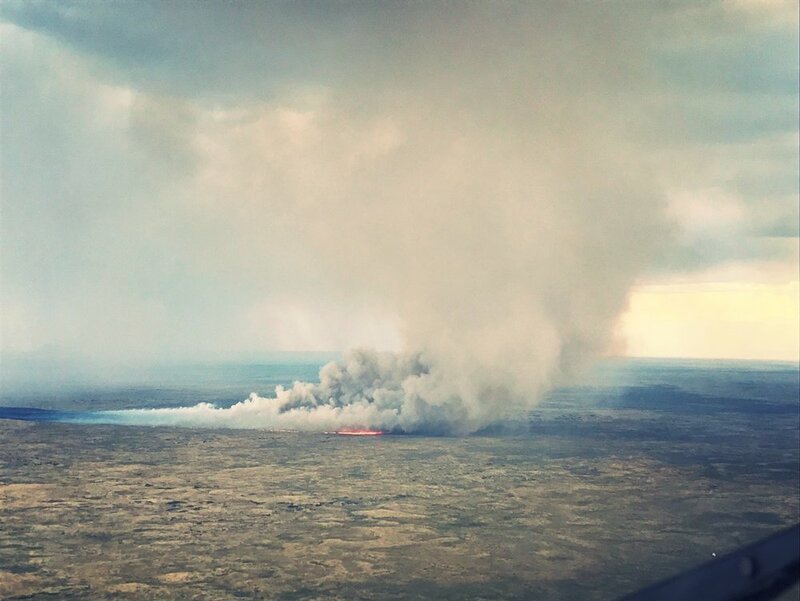 The Wildhorse Fire, ignited by lightning west of Blackfoot, Idaho on the afternoon of July 30, 2017, quickly spread across the grass and sagebrush landscape managed by the Bureau of Land Management (BLM). Despite an aggressive initial attack, the fire quickly grew to 2,000 acres within the first hour after being reported. Multiple air tanker drops in the evening did little to slow the wind-driven, rapidly spreading fire and its extreme fire behavior. As with most fires, the Wildhorse continued into the night threatening public and private property, infrastructure and, in this case, priority Greater Sage-grouse habitat known for its stable populations of breeding birds in the area. The BLM had proactively constructed a network of fuel breaks in the area beginning in 2006 because the area consistently experienced wildfire starts, high winds and rapidly spreading fires. The fuel breaks consisted of mowing a 150-foot swath along both sides of selected roads determined to be strategic for fire suppression operations and response time. These swaths were designed to provide an area of reduced fuel to slow approaching fires and provide a safe anchor point for firefighters to work. Serviceberry Butte Road where the Wildhorse Fire intersected the fuel breaks. The Wildhorse Fire intersected three of these fuel breaks, one decommissioned and two actively maintained (see below map). Burning with extreme behavior, the fire crossed the decommissioned fuel break surrounding Rock Creek Corral Road. Decisions in early 2017 to no longer maintain this fuel break were due to rocky site conditions making maintenance difficult. The fire continued west and southwest toward the active fuel breaks along Serviceberry Butte Road and Cox’s Well Road. Although fire behavior decreased in the early morning hours of July 31, it gained intensity and became erratic as temperatures rose in the afternoon. It was during this second day of erratic fire behavior that the fuel breaks along Serviceberry Butte Road and Cox’s Well Road proved their value and ultimately contributed to full containment of the fire. These fuel breaks allowed firefighters to use the stretches of reduced fuel to their advantage in establishing a safe anchor point from which to enhance their direct-control tactics ahead of the fire’s approach. The investment in a network of fuel breaks provided an invaluable tool that enabled firefighters to stop the fire’s advance, holding the acreage burned at approximately 27,000 acres. This map depicts the Wildhorse Fire as a gray polygon with the fuel break networks and surrounding roads shown in blue.